This is an In Person Signed Colour 12" x 8" Photo of the Indie Pop duo. 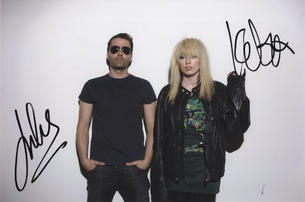 The Ting Tings are an Ivor Novello winning and Grammy nominated indie pop duo composed of Jules De Martino (drums, lead guitar, vocals, piano) and Katie White (vocals, guitar, bass drums, bass guitar, and cow bells). They formed in December 2007 while based at Islington Mill Artist Studios in Salford. They have released four singles on their current label Columbia Records UK, including the single "That's Not My Name", which charted straight at number one in the UK Singles Chart on 18 May 2008. The album We Started Nothing was released on 19 May 2008 and charted at number one in the United Kingdom. The album has now sold over 2 million copies, with a further 4 million singles sold worldwide.